This year, like the year 2017, a letter of the year 2018 was unified from both religious branches: the Cuban Council of Major Priests of Ifa and the Organizing Committee of the letter of the year Miguel Febles Padrón. On June 20, 2016, the consolidation of both letters of the year was communicated in a press conference. Both the founder of the Commission for the letter of the year and the president of the ACYC ratified the agreement. This decision has the support of a large majority of Cuban religious houses. We hope that the new and unique letter of the year will guarantee a greater confidence of the Osha & Ifa practitioners in Cuba and avoid the already frequent confusions. Prophecy: Ire ariku, yale tesi timbelaye, lese Orunmila (having good health, following Orunmila’s advices). Onishe: Aladdimu ni opolopo asogi fun Ifa (offering of various fruits, sixteen different fruits, offered in a basket) and two white candles for Orunmila. Ebbo: A goat, seven machetes, seven flags, land from four corners, sweaty clothes and other ingredients. Flag of the Year: half white half blue, with black trim. Onishe Orunmila: Aladdimu ni opolopo asogi fun Ifá, offering of various fruits (sixteen parts of fruit) offered in a basket and two white candles for Orunla. – Everyone is worthy of respect. – If you do not know with the law that you live in this world, you have to go live in another one. – Parents do not ask for blessing from their children. – If he does not know the way of the right that belongs to him, the dead person does. – The son follows the tradition of the father. Ifa Code of Ethics: The Osorde is a secret act that the Awo must not disclose. Note: in order to clarify any doubt, it is recommended to reffer to the elders. On December 1, 2017, with the presence of a significant number of Cuban babalawos and other countries and members of the Cuban Council of Major Priests of Ifa, ceremonies were held corresponding to the pre-opening of the letter of the year 2018 in the Yoruba Cultural Association of Cuba. 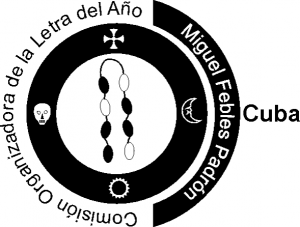 The ceremonies to obtain this Letter of the Year 2018 have been made in the Yoruba Cultural Association of Cuba together with the Miguel Febles Padrón Commission. The ceremony for obtaining the Letter of the Year 2018 has been made at the Yoruba Cultural Association of Cuba. This ceremony has required the ritual feeding of numerous natural positions during the day December 30 of last year.